For the first time, the municipality of Tel Aviv is offering a basket of services to support pregnant mothers and parents of children under 3 as a municipal-wide initiative supported by Urban95. Services include guidance for parents on issues such as nutrition and sleep, as well as services designed to benefit the wellbeing of new parents as they make this transition in their life, involving such issues as family budgeting and relationships. 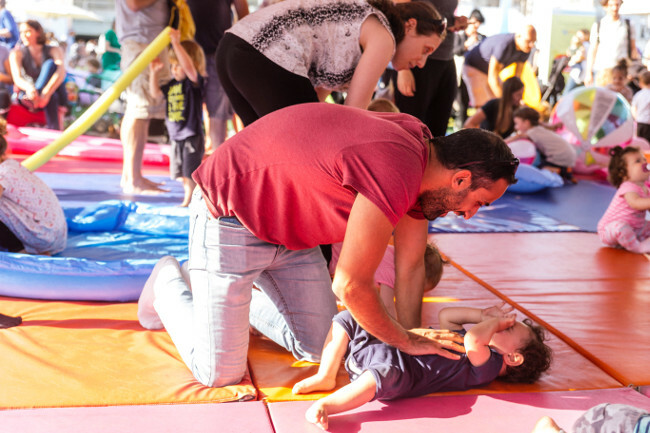 The services also include parent-child activities such as baby massage workshops, music and movement activities, and story time. They are being piloted in six community centres in Tel Aviv, and already the demand is large, expanding to twelve centers. As part of this programme, the municipality is renewing indoor play areas in community centres across the city. 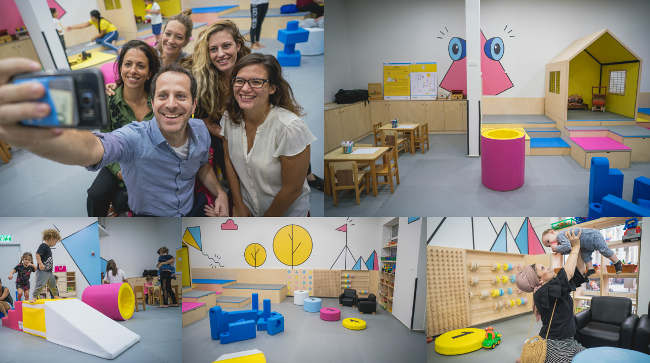 Last week the Mayor of Tel Aviv attended the opening ceremony of a new indoor play area in a disadvantaged area in the south of Tel Aviv – one of 19 in the city and the first to be renovated using the Urban95 approach, with another four renovations already planned. The design for the play area – a collaboration between early childhood development consultants and interior designers – was funded by BvLF’s Urban95 programme, and the construction was funded by the Municipality of Tel Aviv. The aim is to create a cosy space, operated by staff at the community centre and well baby clinics, that encourages play and interaction between parents and children. Pedogogical instructors will staff the centres during select hours to offer guidance to parents on developmental play. Researchers will make observations to see if the new area influences parental behaviour towards early childhood development. In a separate initiative, the Urban95 programme in Tel Aviv transformed an old kiosk into a “junk shed” on one of the city’s main boulevards, filled with outdated technology such as tape recorders, record players and radios. As the below images show, children enjoyed playing with and finding new uses for this equipment, which would otherwise have been scrapped. See the programme’s Facebook page for more. The shed is staffed by a community worker on afternoons, when parents can come with their children and borrow “toys” for their children to play with together with the community. What used to be a normal street has now become a play area and community meeting space. To bolster its parenting services, Urban95 Tel Aviv is disseminating parenting tips based on those developed by Bezos Family Foundation-supported VROOM initiative. They have been translated to provide parents with practical advice on what they can do in their everyday routines to advance the healthy development of their babies and toddlers. Tips have been translated into Hebrew for city-wide distribution through the city’s Digitaf initiative, already reaching 25,000 parents of children under 3 in the city. The tips have also been translated into Tigrinya and made into short video clips to benefit the city’s large population of Eritrean asylum seekers and refugees, in partnership with Mesila, the city’s agency for refugees and migrants. The first two videos have reached 16,000 Eritrean parents. You can see them on YouTube here and here and on Facebook here, here and here. Urban95 Tel Aviv-Yafo is a three-year partnership between the Municipality of Tel Aviv, Tel Aviv Foundation and the Bernard van Leer Foundation. Read more about it here.